I'm going to keep this thing short and sweet. If you like long, confusing diatribes that you can read with Tchaikovsky's 1812 Overture playing quietly in the background, you're well covered. It was a miserable sports weekend for me. In every possible capacity, it was miserable. So in the spirit of not reliving each hard handshake and helmet twist, I'm going to keep it brief. • Shock every Michigan fan with more uniform mischief. To which most UM fans agree that it's all good fun if you win. Lose, and you might as well leave those puppies in the MSU locker room. • Match how physical MSU was playing. • Passing the ball in any capacity with either quarterback. • Blocking. Well, sorta. Tough to block a blitzing swarm when our QBs are dropping back to try downfield throws in a 40 MPH wind. • Tackling. MSU got to, and around the edge all day on us. 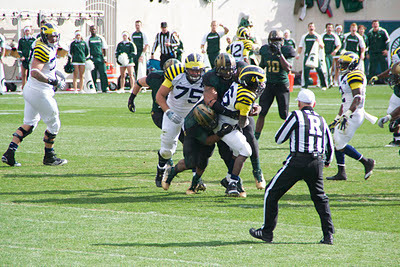 MSU rushed for 213 yards. Edwin Baker alone rushed for 6.4 yards per carry behind a hodge-podge offensive line. • Play-calling. When Denard and Devin combine for an abysmal passing game, why oh why are we passing on 4th and inches on the MSU 9 yardline late in the game??? Play-calling was not great all day, but that play will haunt me for a while. • Overall execution. From the coaches to the players. We got away from what I assume was the gameplan. We allowed Sparty to shake us. I wanted to sleep on it for a night or two before I wrote anything, but I'm more irked by it now than I was when it happened. Let me just say that from this day forward, let's just all assume that when we play Michigan State, it's going to be a dirty, cheap-shot penalty-filled, shameful performance from the Spartans. 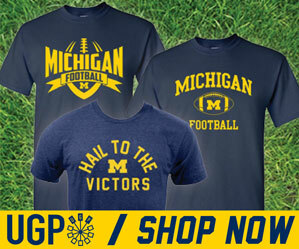 Dantonio has made it his goal in life to beat Michigan – which is fine, I can live with that. But at what point does it go from wanting to win, to winning at any cost? I think we found out last week. It cheapens the game, and the rivalry as a whole when crap like what we saw last week occurs. Shame on Dantonio for seeing how far he can stretch the rules to win (although I'm expecting less and less out of Mark these days). And shame on the Big Ten, I will assume, for allowing it to happen – that's the frustration. For Michigan, we need to move on – which is tough because it's a bye week. But we need to move on. The last two years we allowed Sparty to derail us. I don't think that happens this year because we have a nice entry back into the schedule with Purdue at home, but still – we need to turn the page.